Uber’s driver-facing app is getting big changes to its navigation experience, something Uber is doing to try to help make it easier for drivers to do their job without having to worry too much about switching apps or trusting navigation software designed primarily for consumer use. 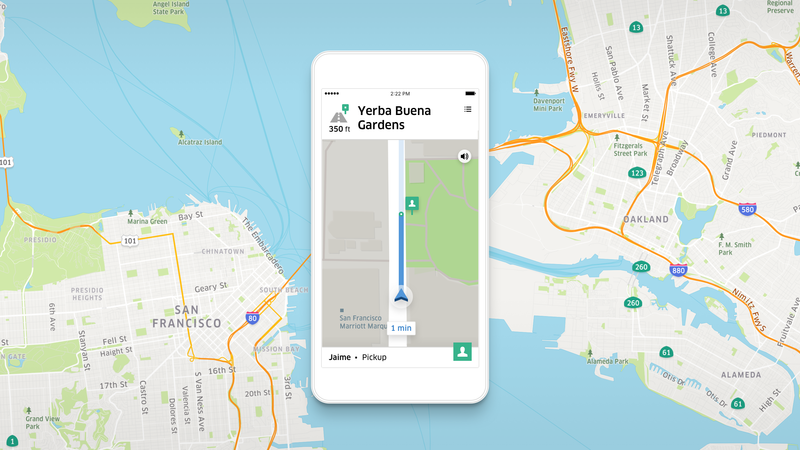 The new Uber navigation experience is an upgrade from what was available in the iOS driver app, and a completely new addition to the Android version of their mobile software. Uber previously relied exclusively on external routing apps, including Google Maps and Waze on Android, offering a “Navigate” button that would pop drivers out directly into their third-party app of choice. Uber’s Maps product team lead Manik Gupta and driver app senior product manager Maya Choksi told me in an interview that the whole project is designed to help improve service in general, offering better routing from point A to point B during a trip, but also improved pick-ups, drop-offs and, perhaps most importantly, improved driver experience. That meant no control over crucial elements of the in-app navigation experience; Uber didn’t have control over the size of labels on display for things like street names and places, nor which to show and which to hide. These labels have varying degrees of importance depending on your purpose with driving, but Uber drivers generally want things that are different from ordinary drivers just getting from place to place. Other factors that Uber’s team considered when developing the app include the average viewing distance — drivers tend overwhelmingly to have their phones mounted around three feet from their face, so the UI is designed to be easily viewed from that distance. Other Uber-specific considerations include routing to places like designed Uber pick-up points at airports that have them, and also identifying places like specific UberEATS parking spots at restaurants for delivery drivers as destinations. “You want to make sure you have all the information, when you need it, in context,” explained Gupta. Uber’s goal overall was not to fully replace navigation apps if drivers prefer to still use other providers’ software, but to ensure that if they do remain within the app, they’re well-served with what’s on offer, thanks to features including different interface options designed to be extra easy on the eyes over many hours of nighttime driving. That’s not to say what Uber is launching is perfect; far from it, says Gupta. They’re very aware that this is a first release for a product that will require a lot more development, he says, and they’ll be gathering feedback from drivers to iterate. Drivers, incidentally, were involved in the product’s initial creation — Uber says that five were brought in for early product design meetings with engineers, and Uber later beta tested with drivers first for very early development, with engineers riding shotgun and making changes on the fly, then in larger geographic tests to make sure that the app met the needs of Uber’s global driver customer base. On Android, it’s a different story altogether, because Uber said it found that drivers tend to make more mistakes when they’re worried about switching apps from managing their trip start and navigation. The goal, again, is to increase efficiency and quality of service, and even little things count when you view Uber’s business as a whole. Uber’s new navigation experience still relies on data from multiple providers — this isn’t Uber kicking Google or others to the curb altogether and going it alone. Gupta says that the intent is, and has always been, to create the best app for drivers in terms of convenience and efficiency, regardless of where the data comes from. Uber obviously has a lot to worry about beyond just routing, but it continues work on product despite executive drama, harassment and culture issues and a lawsuit from autonomous driving competitor Waymo. The question will be how long it can continue to press the pedal on product while other distractions pile up.